The latest addition to the McCain potato range is the limited edition McCain Crispy Bites, tasty, bite-size chips designed for dipping and sharing and ideal for entertaining. McCain Crispy Bites are easy to prepare, simply remove from the freezer, fry or ovenbake and serve. McCain Crispy Bites will be available from July at select Pick ‘n Pay and Checkers Hypers in Gauteng. For consumers who prefer a thicker cut potato chip, then another McCain’s addition to its Oven Chips range is Rustic Oven Chips that boast a popular chunkier cut and come with the skin on – so they not only have added health benefits but also taste delicious. McCain Rustic Oven Chips are made from potatoes and lightly cooked in healthier sunflower oil, are low in saturated fats and have been approved by the Heart Foundation. 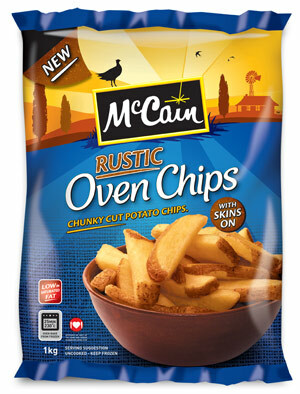 McCain Rustic Oven Chips will be in stock at all major retailers from July 2012.